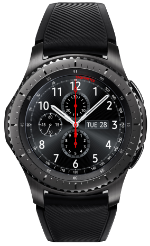 The Samsung Gear S3 Frontier is the latest smartwatch manufactured by Samsung. It comes with a 1.3-inch circular AMOLED display with a 360x360 resolution, 278ppi index and Corning Gorilla Glass SR+. From within its display, the Gear S3 Frontier runs on a dual-core 1GHz Samsung Exynos processor with 768MB of RAM and storage capacity of 4GB. The watch comes with a 380 mAh battery, Bluetooth, Wi-Fi, GPS, NFC, MST, and LTE connection. The Frontier has a military standard 810G rating and IP68 certification for water, shock and dustproof. It has a 46mm case and 22mm band. Upon release, the watch operates on the latest Tizen Wearable OS 2.3.2.